Is there anything happier in that world than a pink iced cupcake? Walking in to Pies Plus at Kogarah you would think they didn't have too many cakes to sell. The shelves look a little barren. There's just one cake on display of each sort availaible. It's not until you place your order and the real take home version comes out from under the counter that you realise these are just for show. And if they've run out? The owner will give you a sheepish smile and apologise. He knows his cakes are good. The cakes here are old fashioned coffee rolls, sponge cakes, fruit, apple, carrot or banana cakes. Iced party cakes, gingerbread men. Neenish tarts, pineapple tarts. The bakers here have kept up some real old time favourites. The outside of the shop hasn't changed in a long time either, in keeping with the bakery menu. 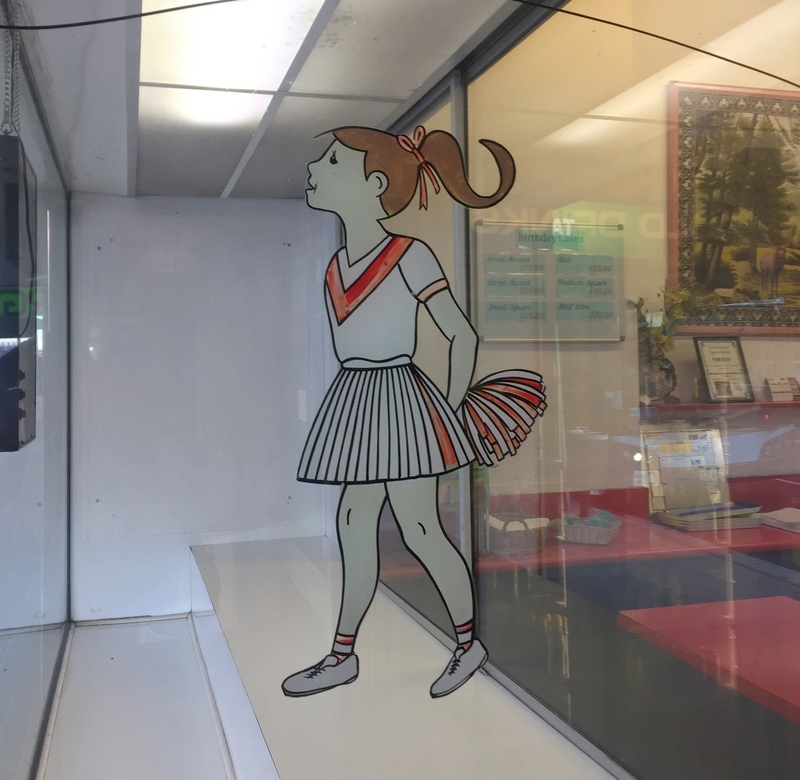 We love this happy football cheerleader painted on the side window, a throwback to glory days of St George rugby league just down the road at Jubilee Oval. She's even wearing Graeme Langland's white boots circa 1975. What we really love here is the small pink cupcake. The pink cupcakes come in two sizes, small bite and big bite. Just dipped on one side with hundreds and thousands, the icing is a hard type that seals over the fluffy vanilla cake inside. One or two bites and its gone. The simple beauty of this cupcake is that is fresh, super cooked-this morning fresh. As cupcake lovers we are amazed at how hard it is to find a good cupcake, it doesn't have to be fancy, just fresh. This is one of the very few bakeries in Sydney that we can find a good one. The same hard as nails icing approach covers the pineapple tart. This little pie is filled with a mock cream and a spoonful of pineapple jam. This one seems to be sticking to the same recipe we remember as kids. Once again, it's nothing fancy, just super fresh and well baked. Pies Plus is at 9 Regent St Kogarah. D: but you guys didn't have their pies! They're not bad and they're cheap. We just concentrated on the 'Plus' side of their name - thanks for the pie tip though!